Which pastry do I choose when I need a little something to pair with my morning latte? Why those fantastic little cookies known as biscotti, of course. With their dry, crunchy texture they practically beg to be dunked into coffee (or from what I witnessed on my recent trip to Italy, a dessert wine called Vin Santo). 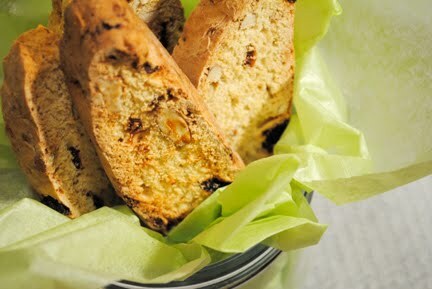 This was actually my first attempt at making biscotti because I had always assumed that they were too challenging...so not true. They appear more time-consuming since they're baked twice, and the dough can be quite sticky to work with, but overall no major heartache. I made two batches, one with the chocolate drizzle and one without for those with an aversion to chocolate (that's crazy talk, I know). To my surprise, the batch without the chocolate drizzle is just as delicious as the one with it. I was so pleased with the results of this recipe, that I'd like to create a savory version using the dough as a base. Now wouldn't this be great, let's say, with cheese and herbs? YUM! Mix eggs, oil, and extracts in a bowl with an electric mixer. Then add in dry ingredients and mix together until combined. Then add in berries and almonds – and either mix by hand with a wooden spoon, or very briefly with the electric mixer. Turn the dough out onto a lightly-floured surface. Knead lightly a few times to be sure that berries and almonds are well-distributed. (Dough will be sticky, so you may need to lightly re-flouring your surface once or twice.) Divide dough in half. Shape each half into long logs, and flatten to 3/4" thickness. Place on a baking sheet and bake at 350 degrees for 35 minutes. Remove rolls from baking sheet and cool for 10 minutes on a wire rack. Then cut each roll diagonally into 1/2" slices. Place the slices cut-sides down on a baking sheet. Reduce oven temperature to 325 degrees, and bake for 10 minutes. Remove, and turn each slice over, and bake for another 10 minutes. Remove and cool on wire racks. To add bittersweet chocolate, simply melt your desired amount in a double boiler or (carefully!) in the microwave. 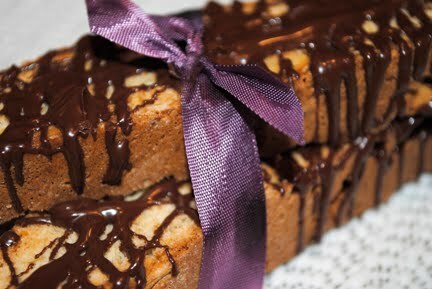 Use a fork to drizzle it over the biscotti slices. send some over asap! they should keep very well on their way to morton grove!